Glenn Mannix (NSW Technical Sales Rep) recently visited a job site where the crew from 3D Tiling were installing exfoliated basalt around a pool using LATICRETE 335 Rapid Premium Flexible Adhesive. 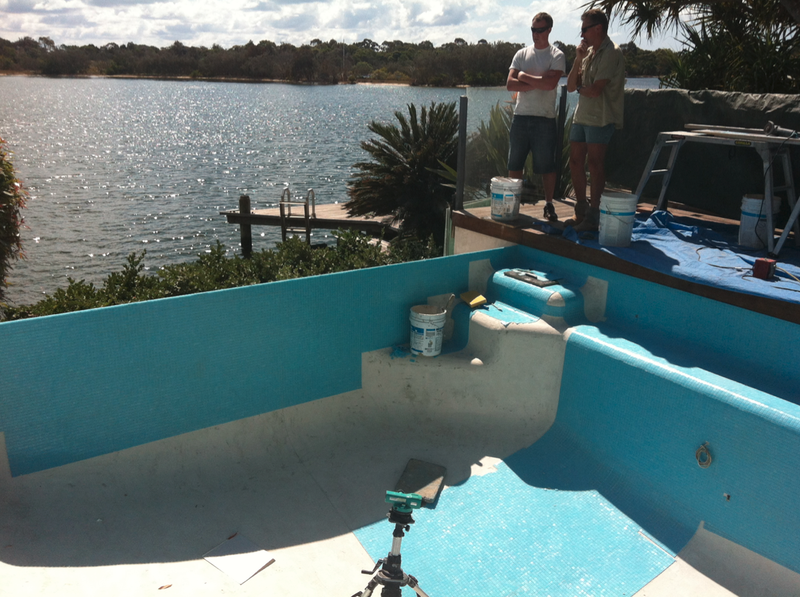 "We use the rapid for its high performance and speed of installation" John Delmar explained. The team was also using LATICRETE PermaColor to grout the area. 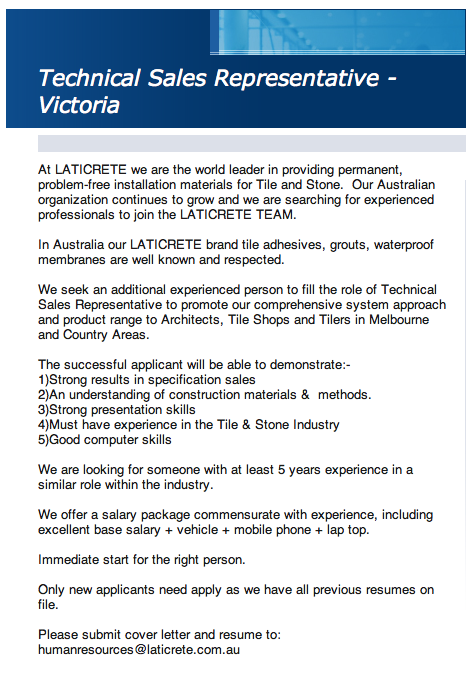 Do you have the "right stuff" to join the LATICRETE Australia Team? LATICRETE Sign for your Shop? NEW! We have this very colourful and attention-grabbing sign available. please click here and let us know! This amazing infinity edge swimming pool in Noosa is being meticulously tiled with mosaic by Don Macdonald and his team from the Orchid Group. 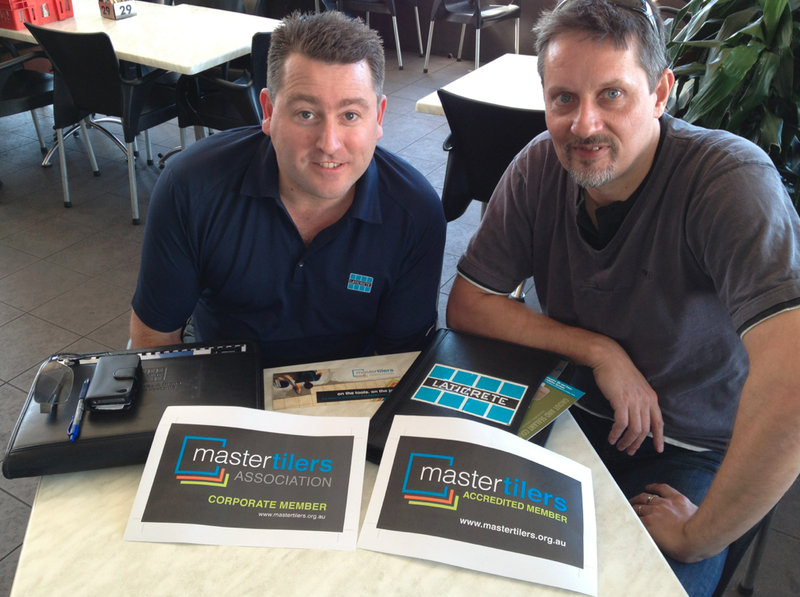 Reuben Craig (QLD Technical Sales Rep) said "Don does OUTSTANDING work with mosaic pools, I haven’t met anyone of this class in a long time." 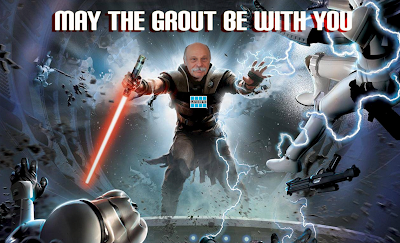 Reuben went on to say "Don uses the complete LATICRETE system and is fanatical. 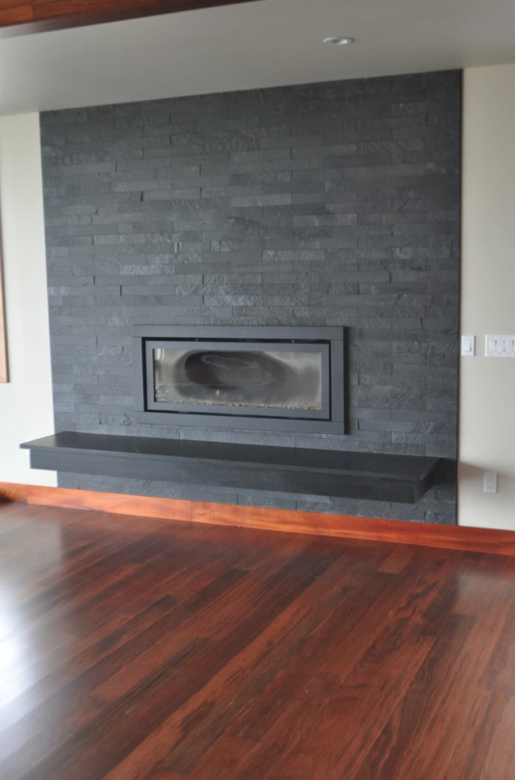 These photos do not do justice to the quality of his craftsmanship. 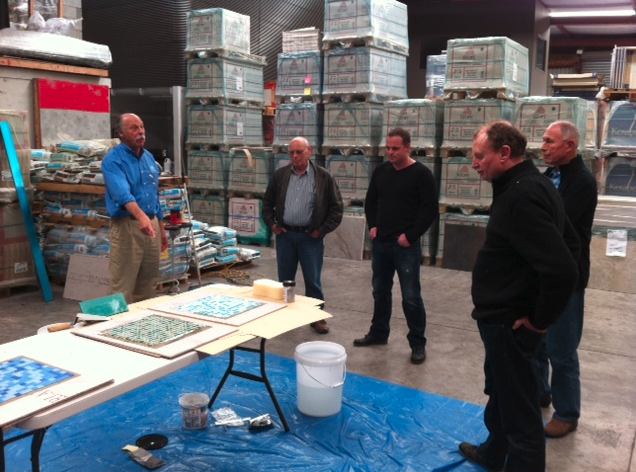 Don also sends his guys to Italy for Bisazza training and ends up teaching THEM!" Joe Tabone and Glenn Mannix (NSW Technical Sales Reps) conducted a LATICRETE SpectraLOCK PRO Grout demonstration at Amber Kotara. 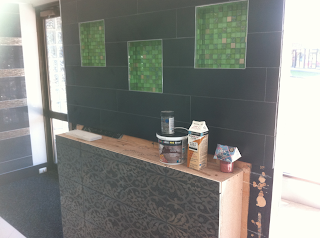 The staff then grouted one of their sample boards and said how easy the grout was to use. Meets performance requirements of ANSI A118.3–1999. 80 minutes working time at 21°C. 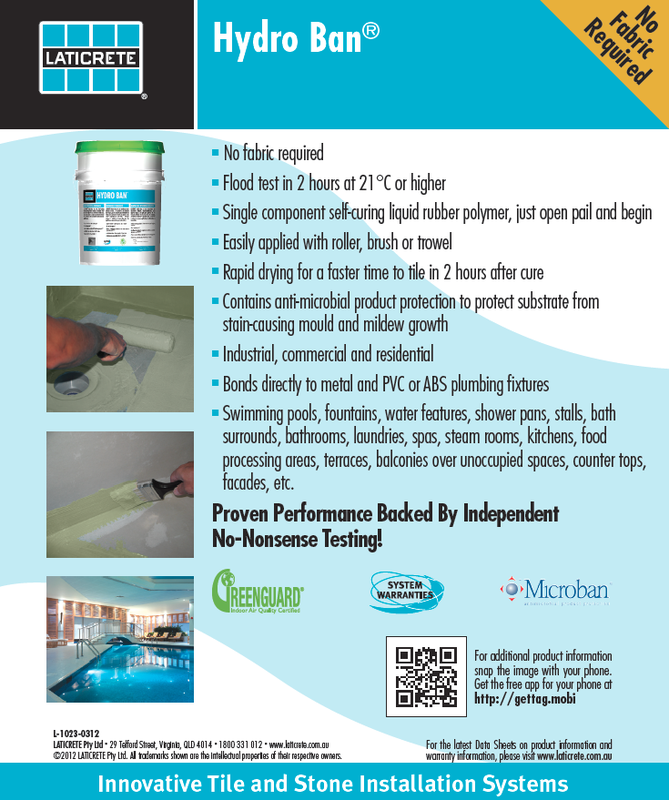 Inhibits the growth of stain-causing mold and mildew in the grout joints with antimicrobial product protection. Uniform colour — no blotchiness or shading. 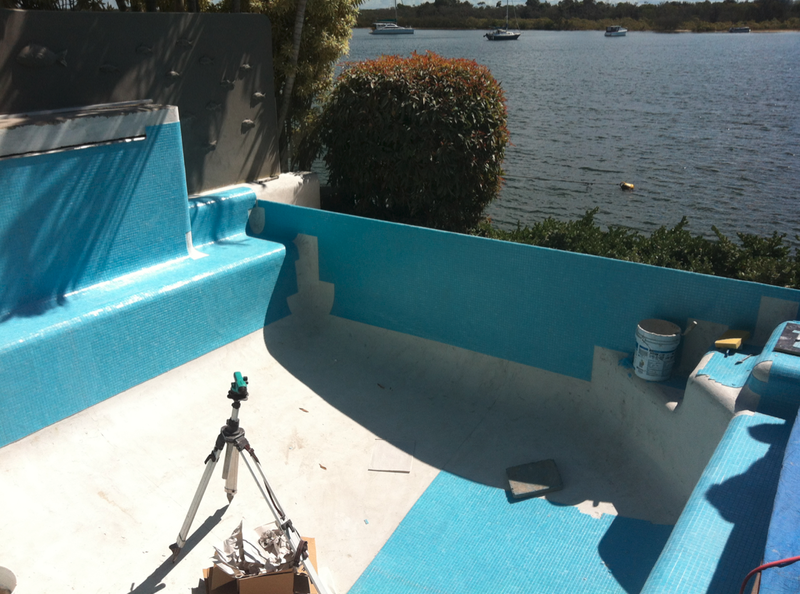 Easy to maintain, cleanable to the original colour. 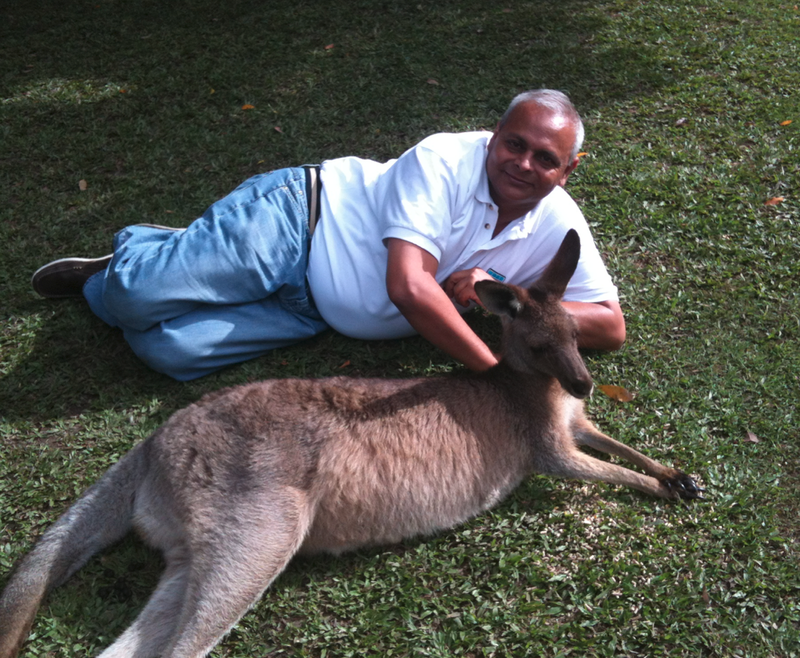 Henry Rothberg (LATICRETE Australia GM) seen in the above picture, isn't it fantastic?! 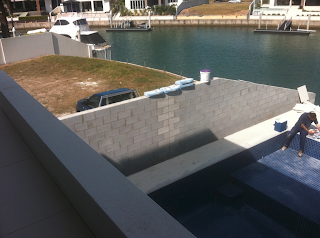 high rise stone facades to rapid transit projects in Singapore to Swimming pools in Australia. 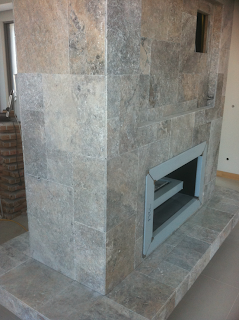 and industrial tile and stone installations. From the grout in the face of the tile or stonework to thin, flexible high strength, shock and vibration resistant adhesives to thin load bearing waterproof membranes to sound and crack isolation materials. LATICRETE offers the products, systems, warranties and technical support to ensure that tile and stone on your projects will be a success. In-depth technical support and installation materials consultation is available throughout the region and world wide. 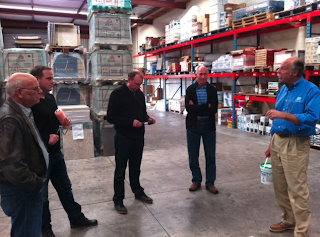 Nick Collett (LATICRETE Australia) and Frank Moebus (Australian Master Tilers Association) and Henry Rothberg (LATICRETE Australia GM) spent time chatting today regarding a wide range of subjects including the commitment that LATICRETE makes to "hands-on" training and educational programs for tile installers. In the next few months LATICRETE will be sponsoring in conjunction with the Australian Master Tilers Association a series of Learning Exchange programs for tiler installers ranging from "Stain-Proof Grout" installation techniques to fast, thin, highly productive sound control materials and methods. These training events will be held at LATICRETE educational facilities in Brisbane, Sydney and Melbourne, Australia. 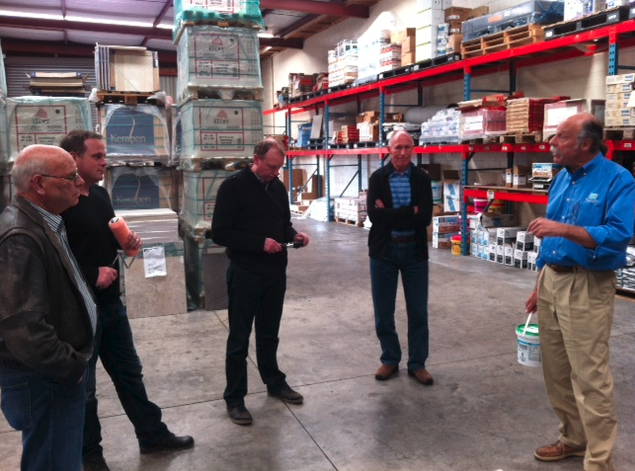 We also do these types of training and educational events at our 7 USA facilities! 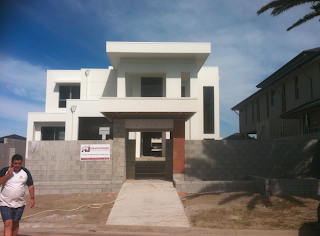 This beautiful home (builder is David Radic) is located on Sovereign Island, QLD. Peter McKeena, a long time LATICRETE user and supporter is tiling this home. 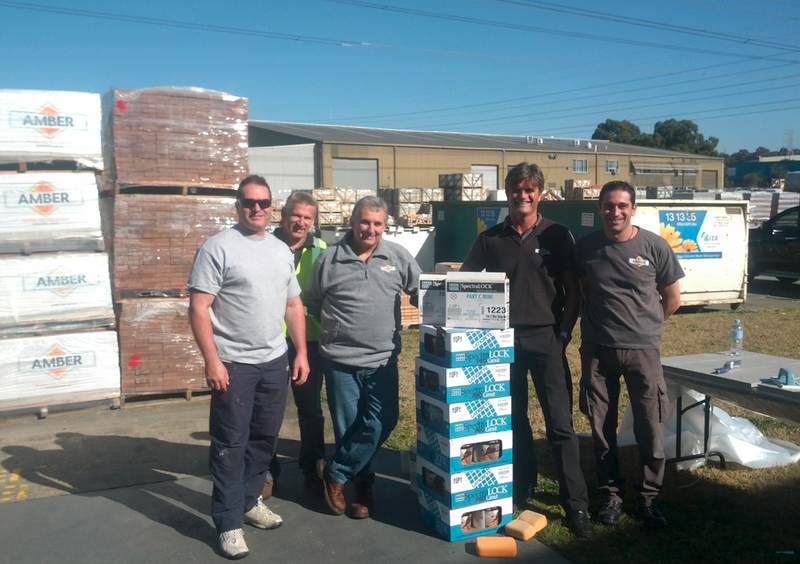 There is over 1000m2 of tiling which will be fixed with LATICRETE 335 Premium Flexible Adhesive. The tiles are a combination of tumbled marble and polished porcelain. Shea Charlish (LATICRETE Australia Graphic Design & Marketing) is pleased with her new pink shirt kindly given to her by Adbri Masonry. 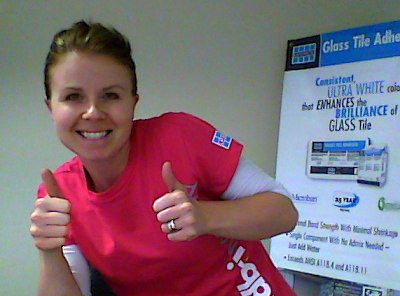 The shirt features the LATICRETE logo, Adbri Masonry logo and the Eldorado Stone logo. LATICRETE and Adbri Masonry have formed the perfect partnership in utilising LATICRETE Masonry Veneer Installation System to install stone. 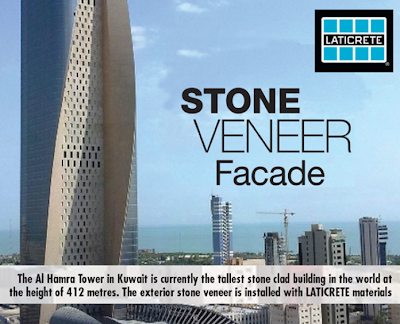 Click here for more information on the amazing innovation of LATICRETE MVIS (Masonry Veneer Installation System). 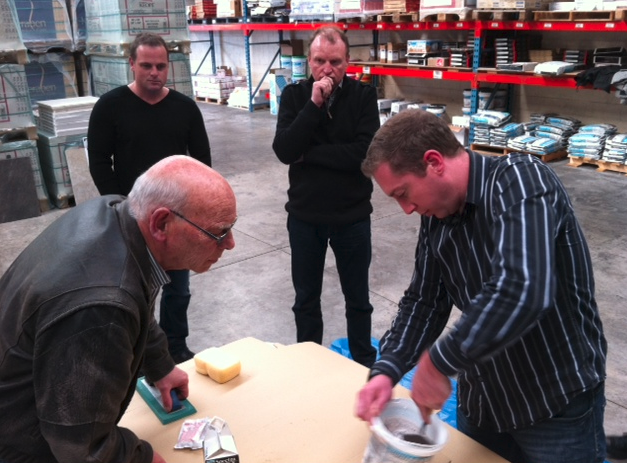 A recent event held at Global Tile in New Zealand. 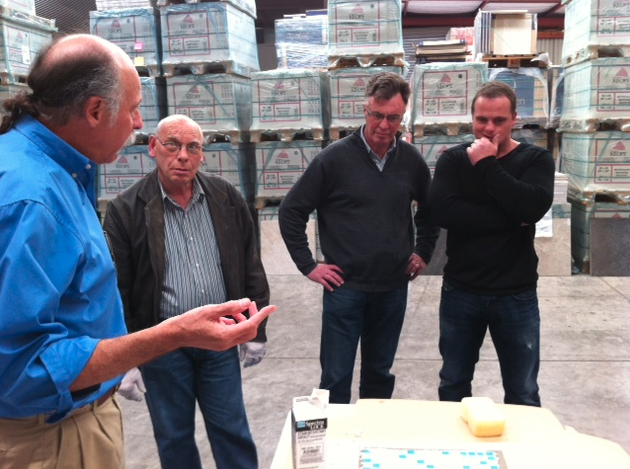 Many LATICRETE products were demonstrated and attendees were able to try out the products for themselves. Amber Tiles at Maroochydore gets "Dazzled"! Nick Collett and Reuben Craig (QLD Technical Sales Reps) recently visited Amber Tiles in Maroochydore - a long time supporter of LATICRETE. 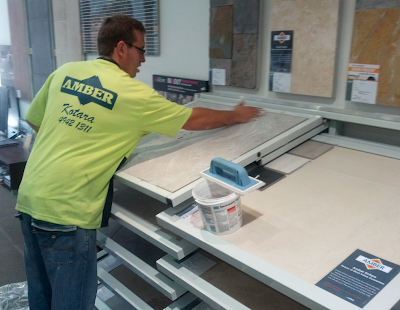 Nick and Reuben Grouted one of the beautiful displays at Amber Tiles with LATICRETE SpectraLOCK PRO Grout (which is stain proof!) 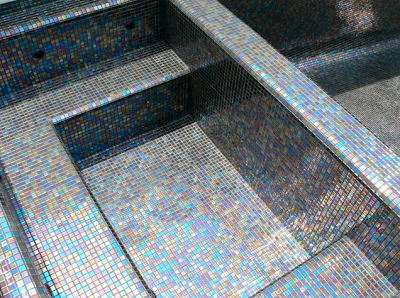 and added the Dazzle component to make the grout really sparkle. 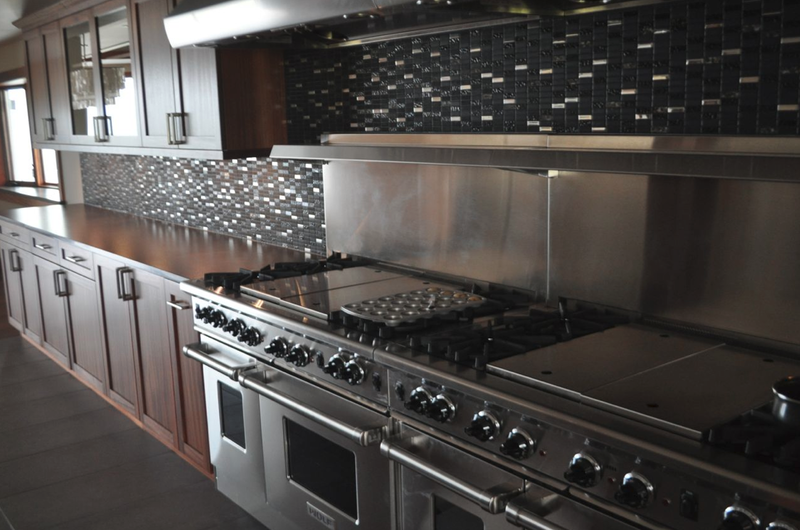 Peter and the team were amazed at how easy it was and was quoted as saying “The Dazzle feature really complements the silver features in the tiles”. Would you like a LATICRETE Technical Sales Representative to visit you and conduct a LATICRETE product demonstration? If so, click here. Click here to view or download the LATICRETE Technical Design Manuals. 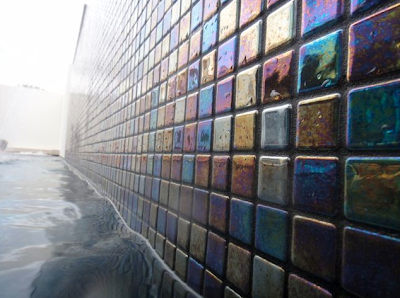 Swimming pools, fountains, water features, shower pans, stalls, bath surrounds, bathrooms, laundries, spas, steam rooms, kitchens, food processing areas, terraces, balconies over unoccupied spaces, counter tops, facades, etc. Proven Performance Backed By Independent No-Nonsense Testing! 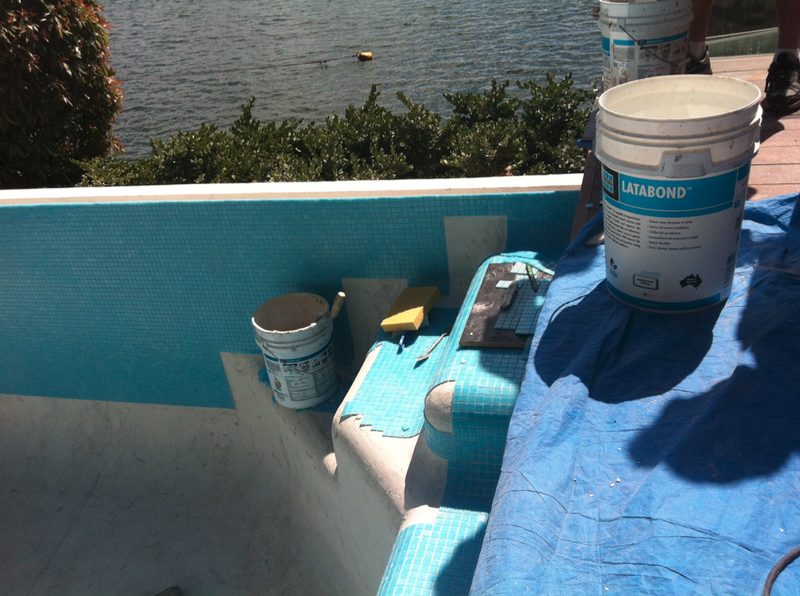 LATICRETE 211 Crete Filler Powder and LATICRETE 4237. 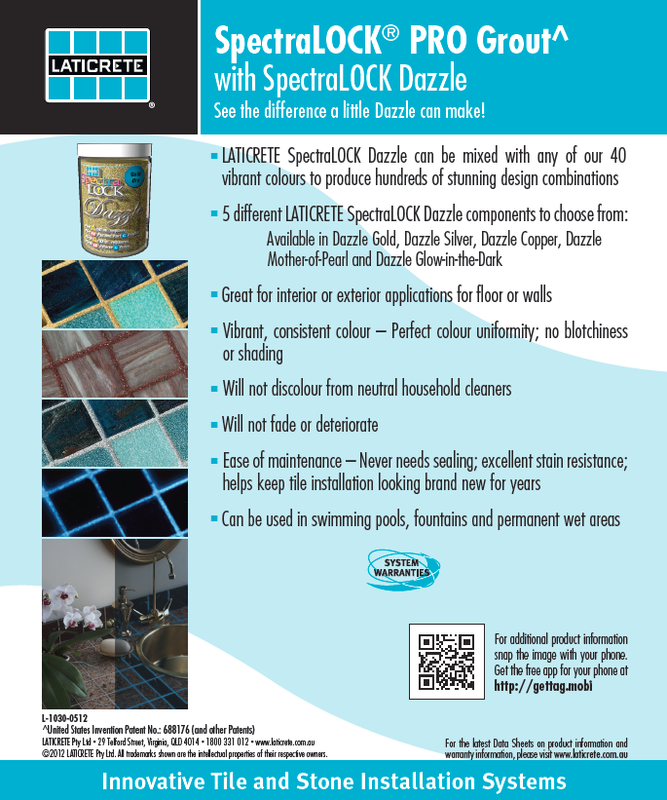 See The Difference a Little Dazzle Can Make! 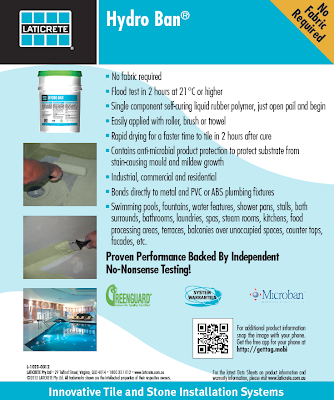 Can be used in swimming pools, fountains and permanent wet areas. 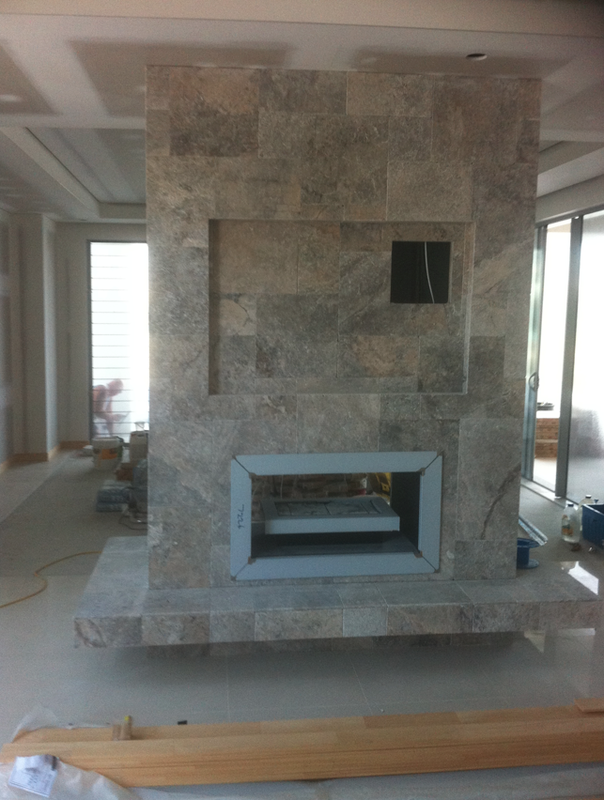 A custom home project recently completed by Higher Standard Tile & Stone, in beautiful upcountry Maui. 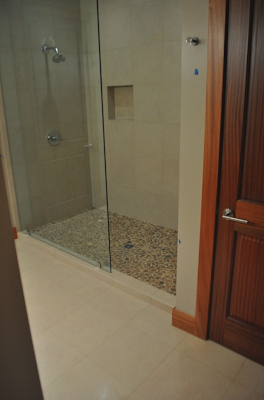 Various stone, porcelain, and glass tile were used throughout the home. Every bathroom was a different design and required various types of installation materials. 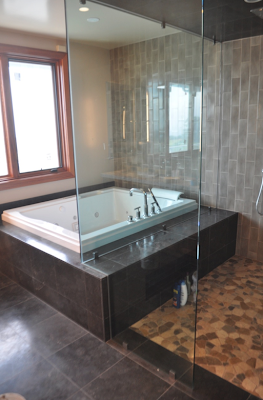 We used a lot of LATICRETE 4-XLT (especially helpful for the 15mm thick stone on the master bath shower ceiling!) 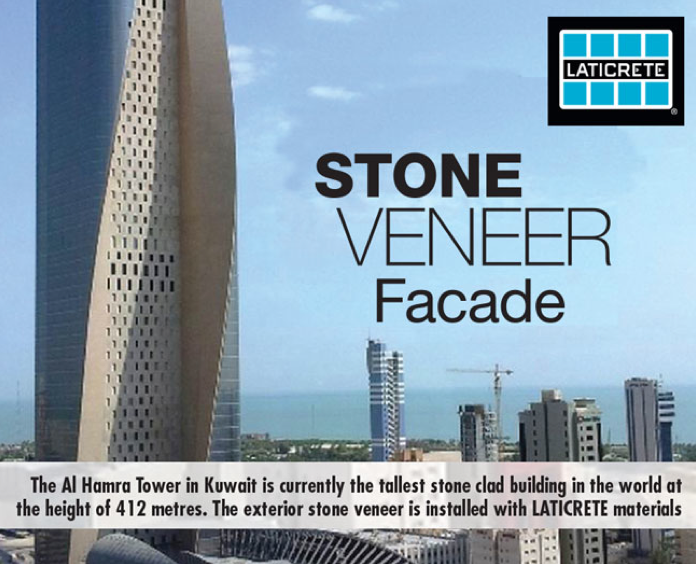 Also LATICRETE 317 with LATICRETE 333 Super Flexible Additive, LATICRETE 253 Gold and LATICRETE 220 Marble and Granite Mortar. LATICRETE Glass Tile Adhesive was used for all the glass tile backsplashes and accent rows. All the showers and tub surrounds were waterproofed with LATICRETE Hydro Ban and LATICRETE Hydrobarrier was used as anti-fracture membrane over the concrete substrate for the bathroom floors. 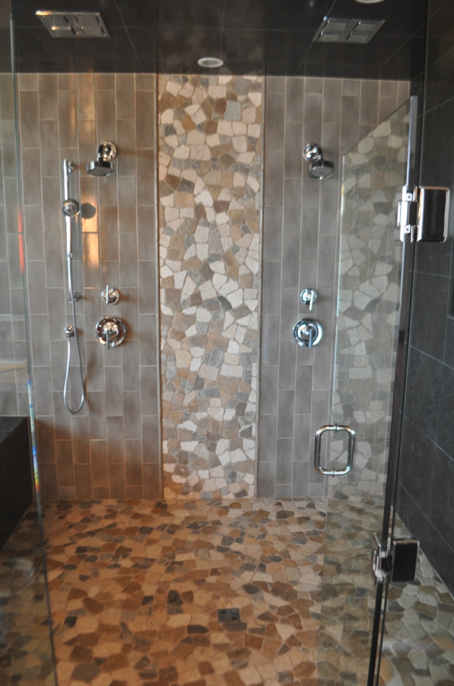 Six colours of grout were used in LATICRETE PermaColor, LATICRETE 1600 Unsanded with LATICRETE 1776 Grout Enhancer, and LATICRETE SpectraLOCK PRO Grout for the pebble shower floors. 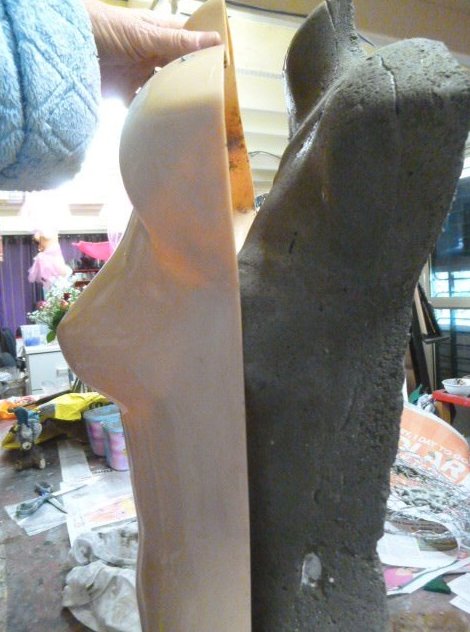 LATICRETE Latasil 100% silicone for change of plane and movement joints. The great service from our local Maui LATICRETE distributor - Hawaiian Ceramic Tile (Susan, Sally, Jason, Kel, and Joe) and the excellent advice from some of your (LATICRETE) top tech people (Art Mintie and Mark Brooks) helped make this project a success. 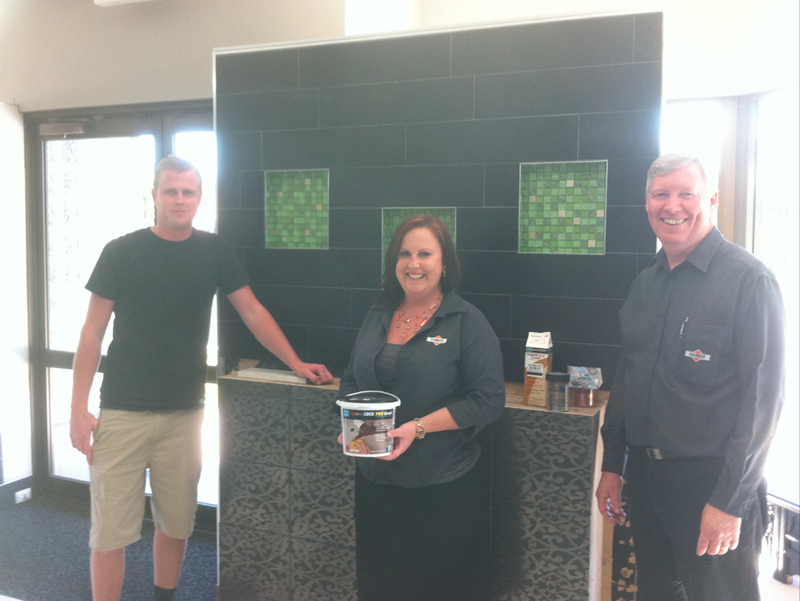 Sandy Robertson from OZ Mosaics is a fantastic and continual LATICRETE advocate. 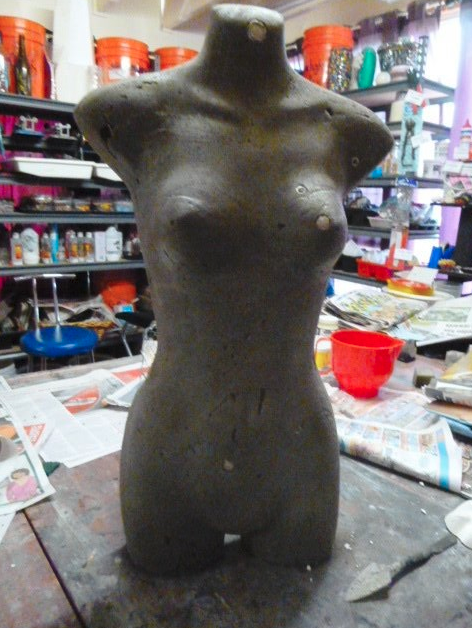 Sandy's recent project involved the need to create a female torso and what better to create it with (in Sandy's mind!) than LATICRETE 3701 Fortified Mortar Bed... Well done Sandy! The ability of a tiling system to meet its designed performance and service requirements is affected by various factors, amongst some of which include: the structural integrity of the tile; the structural adequacy of the substrate; the choice of the correct adhesive or bedding system; the correctness of work methods and the quality of the workmanship. 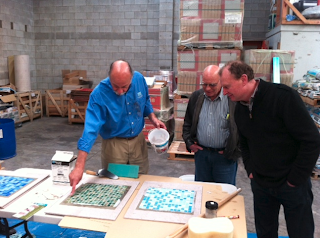 In discussing ways to avoid impact damage to tiling installations, I would like to focus on two of these factors: the choice of the correct adhesive; and the correctness of work methods and the quality of the workmanship. For instance, AS3958.1 states that “Adhesives should be applied to the substrate and then spread using a notched trowel of an appropriate size and shape. 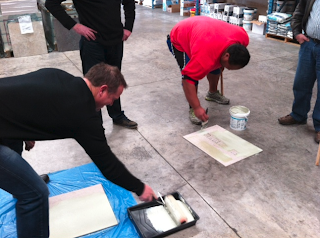 Optimum coverage requires pressing of tiles into the adhesive bed and moving them perpendicular to the direction to the direction of the adhesive notches”. “The contact coverage of the adhesive should be maximised”. 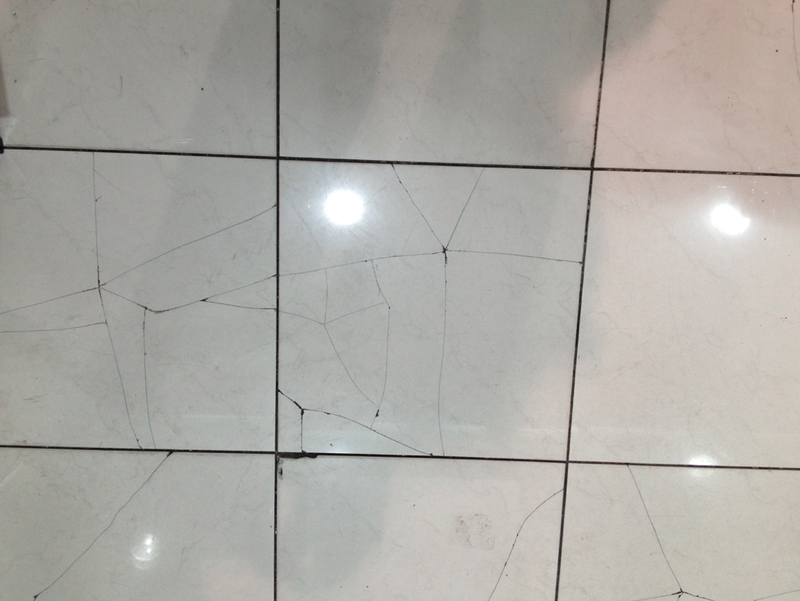 Minimum contact coverage for commercial floors should be 90%. 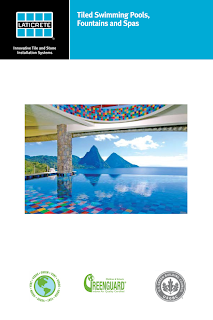 It also goes on to say “The coverage should be sufficiently distributed to give full support to the tile with particular attention to this support under all corners and edges of tiles”. 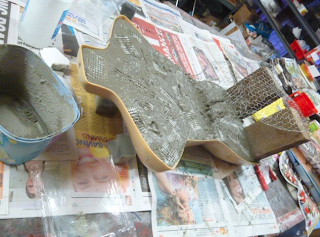 These and other like methods/processes are designed to achieve maximum adhesion, provide full support of the tile and in turn enable load transfer to the substrate. 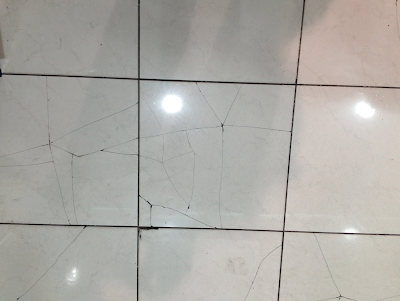 It therefore follows where the tile is not supported correctly; the tile will be susceptible to forces or loadings that could cause fracture or failure if the tile through rolling loads, impact or shock. 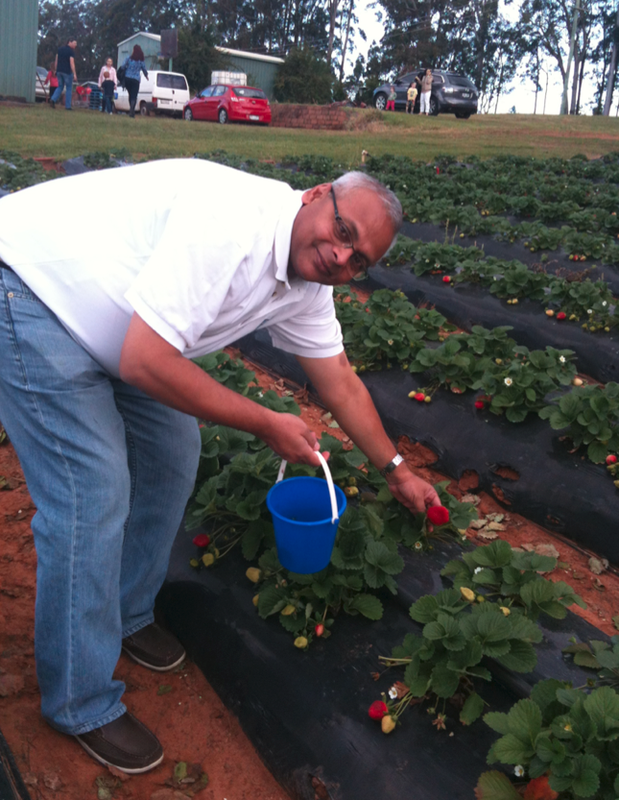 In areas of heavy duty use and perhaps as a matter of course coverage should be targeted at 100%. 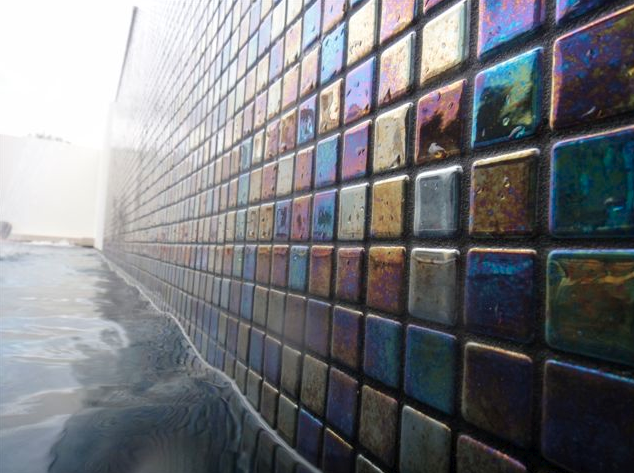 Therefore it is vitally important the tile work is executed in accordance with AS3958.1 & 2 and the like manufacturers guidelines that mandate work methods that are in place to ensure successful enduring installations. 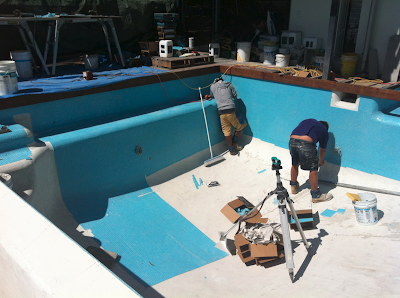 As much as the tile should be fully bedded to transfer loads and absorb shock, it’s the adhesive that has to do all of the work. After all it has to provide the enduring bond that can absorb differential movement from various sources while being subjected to the same duty, impact and shock the tiles is subject to. 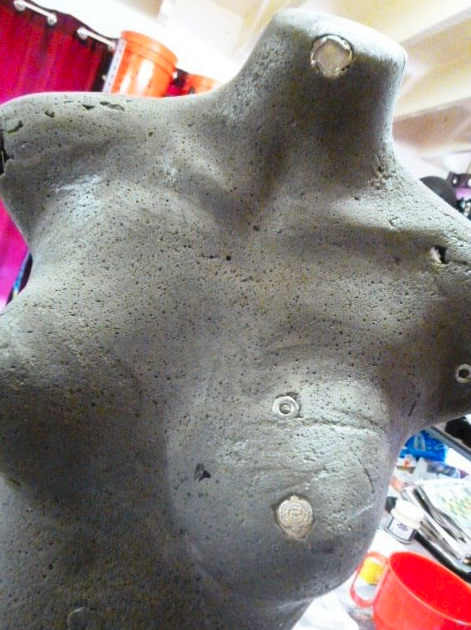 Just like oils ain’t oils, adhesives ain’t adhesives. 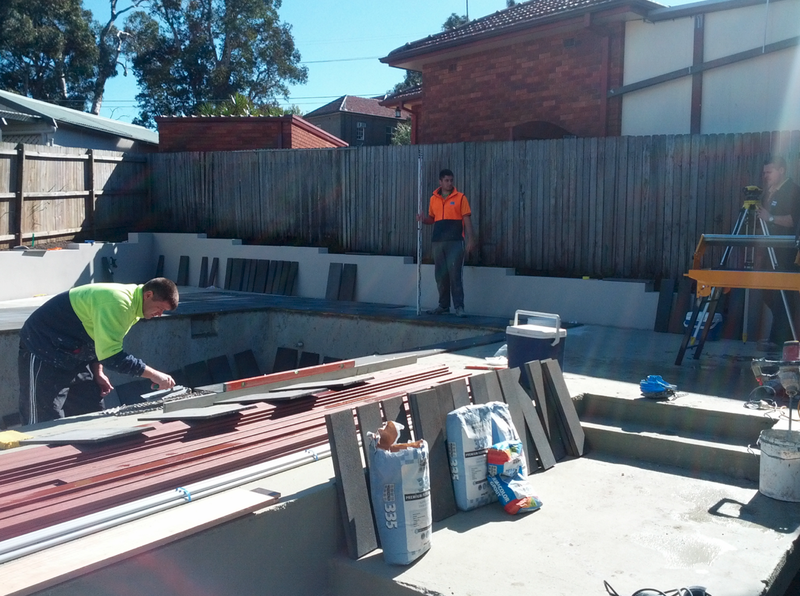 Project service requirements dictate: the performance level of the installation; subsequent installation methods; and installation materials that will deliver the required outcome. Currently in the case of floor tiling, AS3958.1 categorises performance levels into three groups Industrial, commercial and Residential whilst in the US the TCNA Handbook, I think sensibly, categorises them as, Extra Heavy, Heavy, Moderate, Light and Residential. 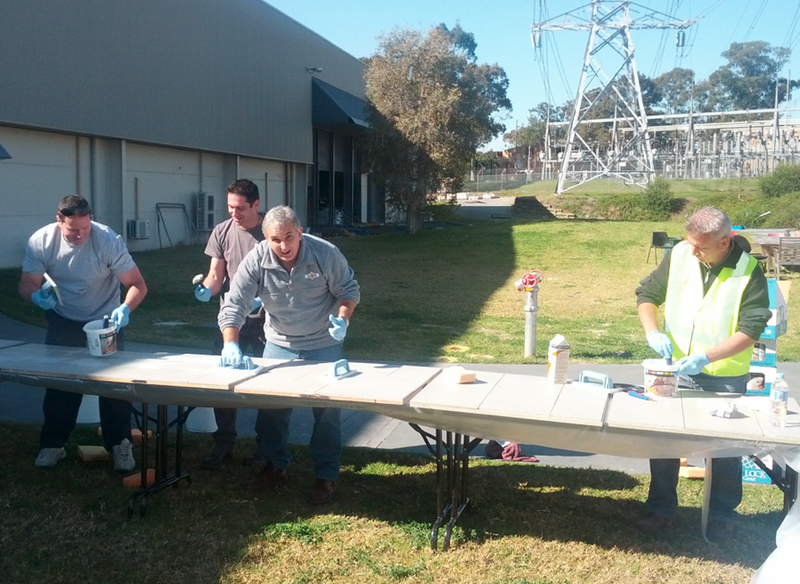 Therefore it makes sense that adhesives are designed to perform within the scope of the performance requirement specified a particular project. 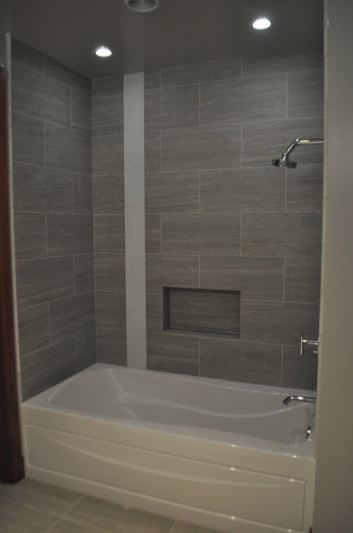 LATICRETE are the manufacturers of Tile and Stone adhesive systems that are lighter, stronger, more flexible, and are suitable for just about any service duty, tiles are expected to endure. 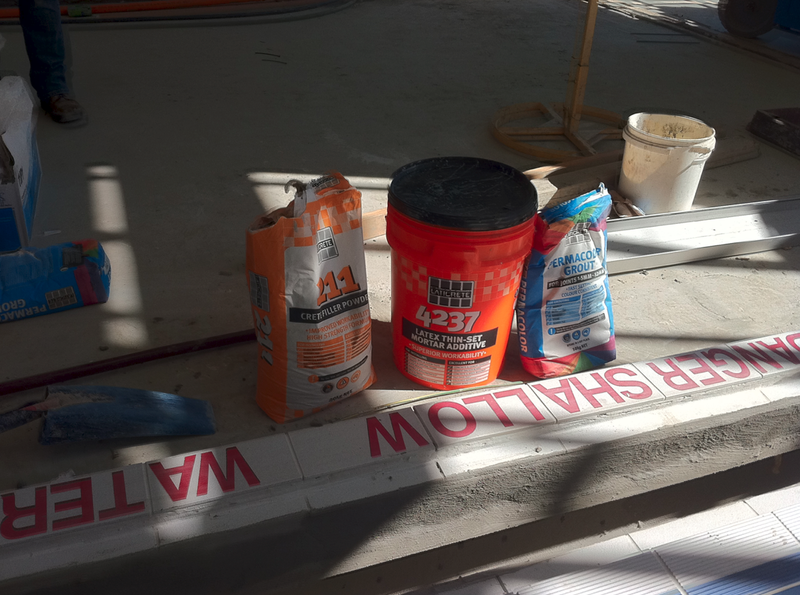 LATICRETE 4237 Latex Additive gauged with LATICRETE 211 Crete Filler Powder is a good example of an adhesive to use where “Extra Heavy Duty” is required. International LATICRETE Guest's Kangaroo Encounter! 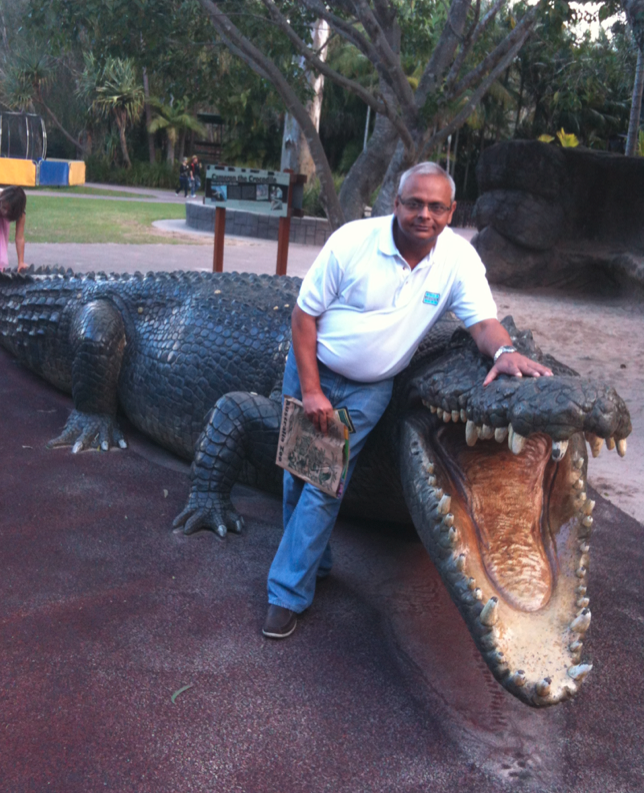 Recently LATICRETE Australia had the pleasure of welcoming Mr. Sujit Singh (General Manager of LATICRETE/RAK in UAE) visit for our Annual Sales Meeting. 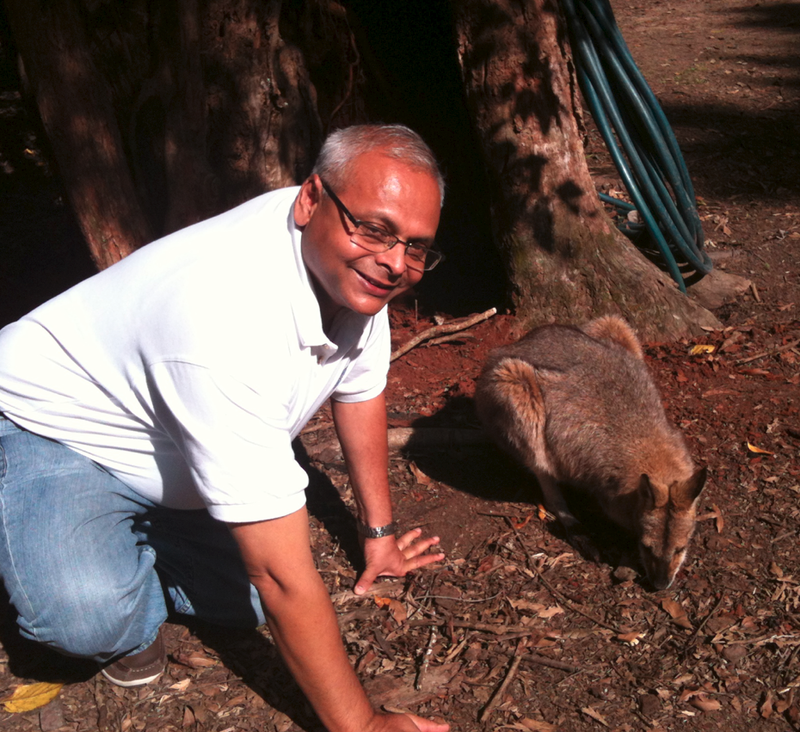 As it was Mr. Sujit Singh's first time visiting Australia, a few "true blue" experiences were on the agenda, such as a day out with LATICRETE Australia's R&D Chemist, Dr Surendra Patel at Australia Zoo and also picking some strawberries! LATICRETE prides itself on the exchange of knowledge and experiences between LATICRETE team members across the globe. A beautiful tile installation using LATICRETE 335 Premium Flexible Adhesive and LATICRETE SpectraLOCK PRO Grout, installed by Marcello and Fabio Capochiano in NSW. 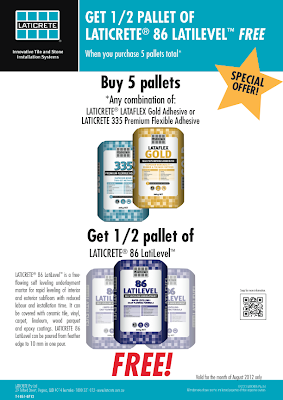 For more information about LATICRETE 335 Premium Flexible Adhesive click here. 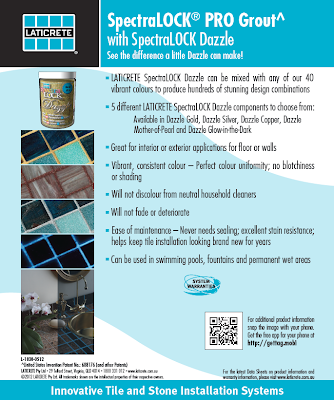 For more information about LATICRETE SpectraLOCK PRO Grout click here. 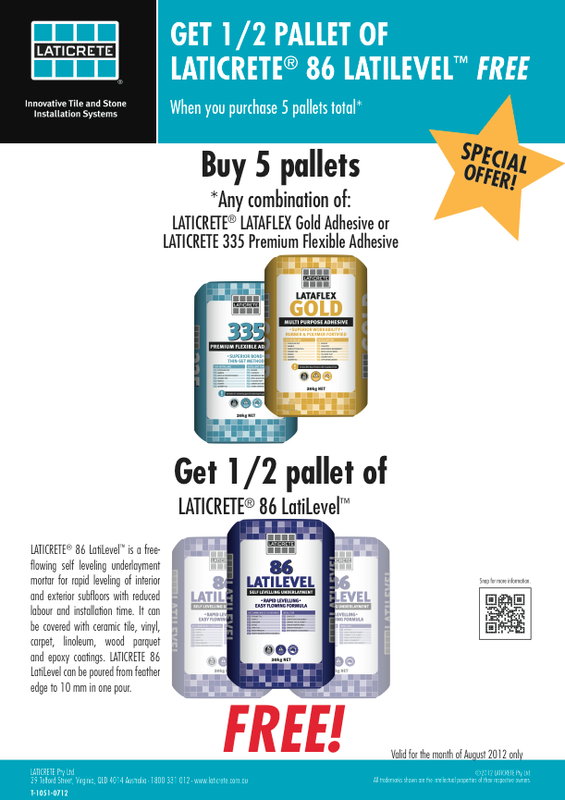 Get half a pallet of LATICRETE 86 LatiLevel FREE when you purchase 5 pallets total any combination of LATICRETE LATAFLEX Gold Adhesive or LATICRETE 335 Premium Flexible Adhesive. 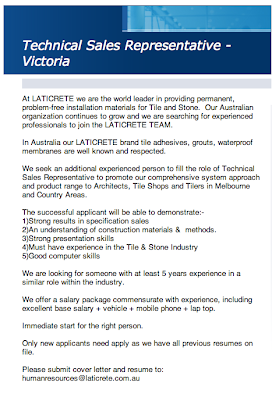 LATICRETE 86 LatiLevel is a cementitious powder that is mixed with water to produce a free-flowing self-levelling underlayment mortar for the rapid levelling of interior sub-floors. Can be poured from feather edge to 10mm in one pour. LATICRETE 86 LatiLevel will produce a smooth and flat surface with excellent durability, which is ready for foot traffic in less than 4 hours at 21°C. The primer will increase bond and strength to substrates.